These days, custom manufacturing is keeping Aussie manufacturing businesses alive, as there are very few, if any, Australian manufacturers who can compete directly with cheap imported Chinese goods. 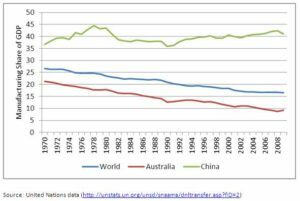 China’s mass production ability, combined with comparatively low wages, has resulted in cheap imports flooding the Australian market, providing a substantial challenge for the Australian manufacturing sector. The decline in Australian manufacturing is no secret, and manufacturing’s share of national employment dropped from 30.5 per cent in 1965 to 7.8 per cent in 2016, according to an Australian Manufacturing Workers’ Union-commissioned study. Queensland University Social Sciences researcher, Dr Jenny Povey, recently urged Australia’s federal and state governments to increase investment and intervention. “They should learn from Germany, if Australian manufacturing is to be saved,” she said. “The German government spends AUD$3.2 billion annually funding a network of research institutes to drive innovation, and their manufacturing sector contributes 22.6 per cent of GDP, underpinned by partnerships between researchers and industry. “The German model works to drive exports of manufactured goods and create jobs. A number of Australian manufacturing businesses are heeding this warning, and instead of trying to compete, they are evolving to deliver quality, custom manufacturing solutions that are specifically designed for customer needs, are of higher quality, and meet Australian Standards. A recent Commonwealth Scientific and Industrial Research Organisation (CSIRO) article acknowledged this trend, highlighting some of the innovative bespoke offerings produced by Australian manufacturing. An Australian manufacturer who has been successfully delivering custom solutions is Bremco Metal Products. 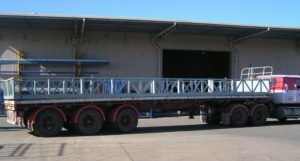 A Brisbane-based metals fabricator, Bremco works closely with customers to design, engineer and fabricate bespoke products such as steel trolleys, container ramps, heavy duty freight cages, crane cages, custom brackets and truck pallets.